Familiarize students with the basics of a budget. 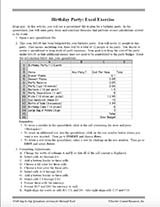 In this lesson, students learn how to use a spreadsheet to calculate party expenses. This computer activity requires the Microsoft Excel® computer application.